The U.S. Food and Drug Administration today approved the first heart pacemaker designed to be used safely during certain magnetic resonance imaging (MRI) exams. Cardiac arrests that can be treated by electric stimulation, also known as shockable arrests, were found at a higher frequency in public settings than in the home, according to a recent study. The number of Americans who report being aware of chronic obstructive pulmonary disease, or COPD, increased by 4 percentage points between 2008 and 2010, but many people at risk are still unaware of the disease, according to mailed survey results released today by the National Heart, Lung, and Blood Institute (NHLBI), part of the National Institutes of Health. Blanketrol mattress and blanket used for body cooling. The National Heart, Lung, and Blood Institute (NHLBI), part of the National Institutes of Health, has launched the first large-scale, multicenter study to investigate the effectiveness of body cooling treatment in infants and children who have had cardiac arrest. The Therapeutic Hypothermia after Pediatric Cardiac Arrest (THAPCA) trials total more than $21 million over six years. Therapeutic hypothermia, or body cooling, has been successfully used in adults after cardiac arrest and in newborn infants after birth asphyxia, or lack of oxygen, to improve survival and outcomes, but it has not been studied in infants or children who have had cardiac arrest. During body cooling treatment, THAPCA participants lie on mattresses and are covered with blankets. Machines circulate water through the blankets and mattresses to control the participants’ body temperatures. Researchers do not yet know how body cooling will affect participants, since many factors can contribute to brain injury after cardiac arrest. However, they believe body cooling could provide several benefits, including less inflammation and cell death. According to a 2008 review of pediatric cardiopulmonary resuscitation in the journal Pediatrics, about 16,000 children suffer cardiac arrest each year in the United States. Their hearts stop pumping effectively, and blood stops flowing to their brains and other vital organs. In many cases, the outcome is death or long-term disability. Cardiac arrest in infants and children has many causes, such as strangulation, drowning, or trauma. It can also be a complication of many medical conditions. “Our goal is to minimize brain injury in infants and children who experience cardiac arrest and ultimately improve survival rates,” said co-principal investigator J. Michael Dean, M.D., M.B.A., professor of pediatrics and chief of the Division of Pediatric Critical Care Medicine at the University of Utah School of Medicine, Salt Lake City. The THAPCA centers enroll participants in one of two randomized, controlled clinical trials. One evaluates participants who suffered cardiac arrest outside the hospital, while the other evaluates participants who suffered cardiac arrest in the hospital. Within each trial, there are two active treatment groups: therapeutic hypothermia (cooling the patient to 89.6-93.2 Fahrenheit) and therapeutic normothermia (maintaining the patient at 96.8-99.5 Fahrenheit). Both trials are trying to reduce fever, which commonly occurs after cardiac arrest and can lead to more severe outcomes. “These trials are addressing the question: What is the optimal temperature for an infant or child after cardiac arrest?” said co-principal investigator Frank W. Moler, M.D., M.S., a professor in the Department of Pediatrics and Communicable Diseases at the University of Michigan, Ann Arbor. He added that in previous studies exploring therapeutic hypothermia, the comparison or control groups did not receive therapeutic normothermia to prevent fever. Woman lying on a Blanketrol mattress and blanket used for therapeutic hypothermia. 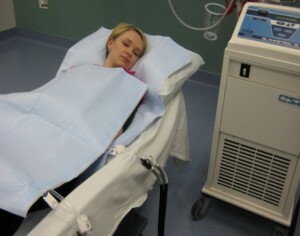 Blanketrol mattress and blanket used for therapeutic hypothermia. Participants in the THAPCA trials must be older than 48 hours and younger than 18 years and must be enrolled in the study within six hours of suffering cardiac arrest. Once a parent or guardian provides consent, the participant is randomly assigned to one of the two treatment groups. The therapeutic hypothermia group in each trial receives the hypothermia treatment for two days and then normothermia treatment for three days, which ensures that the body temperature is kept within a normal temperature range. The patients in the therapeutic normothermia groups receive normothermia treatment for all five days. After the five-day period, the clinical care team will continue to provide study participants with optimal medical care. Participants will undergo neurological and behavioral testing a year after the cardiac arrest. The THAPCA trials involve 34 clinical centers in the United States and Canada. The C.S. Mott Children’s Hospital at the University of Michigan serves as the lead clinical center, while the data coordinating center is based at the University of Utah School of Medicine. What Triggers Heart Attacks and Stroke? Strokes, heart attacks, and cardiac arrest are usually the result of cholesterol-rich plaque deposits in the arteries going to the brain and heart. They occur, when a particular activity triggers them. Stressful physical exertion, anger, waking up from sleep, and certain infections are some of the triggers that top the list. While most heart patients perform each of the above activities at one point or another, knowing the triggers can help you take measures to prevent them or control their intensity when they occur. Atherosclerotic heart disease due to high cholesterol is one of the main causes of fatalities and disabilities around the world. However, following a healthy lifestyle goes a long way in lowering LDL cholesterol and preventing heart problems. To meet healthy cholesterol level goals, there are step-by-step guidelines outlined by the National Cholesterol Education Project. Following a healthy diet that is low in trans and saturated fats and including exercising in your daily routine is the key. For better results, you can go in for effective medicines available today to accomplish the remaining task.